Technical coil coatings refers to a process in which the material used for coating is applied on a metal strip. This process involves chemical pre-treatment of the metal surface on one side or both the sides. It has application in various industries such as automotive, construction and others. Growth of the technical coil coatings market is fueled by increasing demand for corrosion free products. Moreover, the increasing demand from various industries such as automotive and construction has further propelled the global technical coil coatings market. However, stringent government regulations on emission of harmful chemicals such as VOCs (Volatile Organic Compounds) is one of the major restrain for the global technical coil coatings market. Polyester was the dominant segment in the technical coil coatings market in 2016 and is expected to continue its dominance over the forecast period with a CAGR of 5.22%. This is owing to its properties such as resistance to UV light and providing barrier coat to prevent corrosion of the substrate. Polyester can be modified as per requirement and applications, hence, proves to be a viable choice. For instance, polyester are used for roof and wall cladding on buildings. Manufacturers are focusing on developing eco-friendly products, which is further gaining traction and thereby driving growth of this market at a global level. For instance, in 2013, Evonik Industries developed a range of polyester resins for primers and top coats, which the company markets under DYNAPOL brand and is based on renewable raw materials. Powder coatings are used for protective and decorative finishes and have application in industries such as automotive, architecture, furniture, and appliances. Powder coatings are corrosion, weather, and chemical resistant and are also chipping and scratch resistant, and other such wears. Moreover, it is cheaper than liquid coatings, owing to lower power consumption, reduced disposal cost, and low material cost making it a cost-efficient choice. Liquid coil coatings are applicable in both primer and top coat and is used for imprints, attractive surface finishes, gloss grades and others, offering resistance against environments, scratch resistance, and high flexibility. Asia Pacific dominated the technical coil coatings market in 2016 with a revenue of US$ 1978.9 million and is expected to continue its dominance over the forecast period. This is attributed to growth of automotive and construction industries in the region. According to International Trade Administration (ITA), China is the world’s largest construction market and was valued at US$ 717.71 billion in 2016 and is estimated to reach US$ 1,042.17 billion in 2021. Construction sector was the largest market for technical coil coatings with a market share of 65.31% in 2016. This is owing to growth of the construction sector in emerging economies of Asia Pacific, further contributing to growth of this market. According to the Department of Industrial Policy and Promotion (DIPP), the Foreign Direct Investment in construction development sector in India from 2000 to 2017 was US$ 24.3 billion. Moreover, furniture segment is also expected to exhibit growth over the forecast period. The major players operating in the global technical coil coatings market include PPG Industries Inc., BASF S.E., Akzo Nobel N.V., The Valspar Corporation, DowDuPont Inc., The Sherwin-Williams Company, Backers Group, and Kansai Nerolac Paints Limited. Technical coil coatings is used in various end-use industries such as construction, automotive, furniture, HVAC, home appliances, and others. Coil coatings offer protection against changing weather conditions and improves durability of coated substrates. Leading market players are investing in order to develop new products to increase coil coating product portfolio for extending their application areas in major end-use industries. In December 2016, PPG Industries Inc. launched ‘DURASTALL ULTRA-COOL’, advanced Silicone modified polyester coil coating with infrared reflective pigments for building components such as metal roofing, siding, and panels. 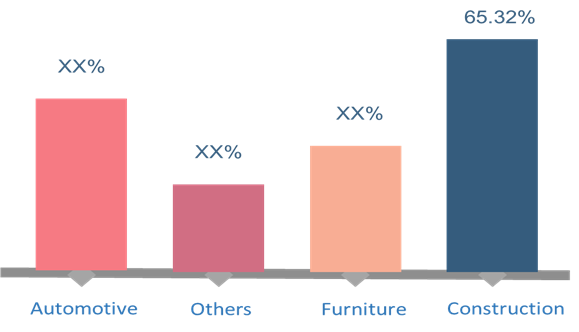 Polyester segment accounted for highest revenue share in the global technical coil coatings market in 2016 and the segment is projected to retain its position, due to high demand for polyester coating in construction and furniture industries. In construction, coil coatings has a variety of application such as metal roofing & siding, windows, and doors. Therefore, construction segment is the major segment in End-use Industry. Asia Pacific was the dominated market in 2016 and the region is projected to be the fastest growing in the global technical coil coatings market over the forecast period. The growth of Asia Pacific technical coil coatings market is attributed due to growth of end-use industries along with strategic investment by leading market players such as PPG Industries Inc., BASF SE in the region to tap potential market in China, India, and South Korea. For instance, in June 2016, BASF SE expanded its local production capacity for waterborne and solvent-borne coating in Thailand to capitalize on growth opportunities in ASEAN market. Key companies covered as a part of this study includes PPG Industries Inc., BASF SE, Akzo Nobel N.V., The Valspar Corporation, DowDuPont Inc., The Sherwin-Williams Company, Beckers Group, and Kansai Nerolac Paints Ltd.
*Browse 145 market data tables and 60 figures on "Technical Coil Coatings Market - Global forecast to 2025”.